Water stable isotopes are applicable as tracers since these are present in the various processes of the hydrological cycle. Due to their mass differences the heavy isotopic species of water are preferentially distributed in the condensed phases, while the lighter isotope species are preferentially evaporated. The isotopic composition of atmospheric water vapor provides information on moisture transport processes and phase changes in the atmosphere. The study of the isotopic composition of water vapor is of great interest because water vapor is recognized as one of the most important greenhouse gases with a positive feedback in global warming. 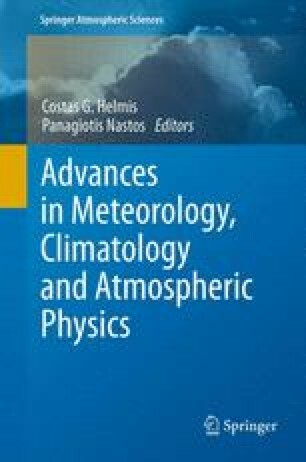 This paper presents the results of a 3-year sampling of the isotopic composition (δ18Ο) of atmospheric water vapor in Greece. The temporal variation of δ18O and its link to various meteorological parameters is investigated. Finally, a statistical model for the estimation of atmospheric water vapor δ18O is proposed, in order to capture the dependence of δ18O on the concurrent meteorological conditions. The results of the isotopic model are compared with measurements.